These men constitute the main infantry force of the Ilergetes, a powerful people that hails from Northeastern Iberia, bordering to the west the mighty Celtiberians, of whom they are natural enemies. 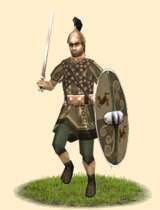 The Milites Ilergetum ("Ilergetan Soldiers") constitute the main infantry force of the Ilergetes, a powerful people that hails from North-eastern Iberia, bordering to the west the mighty Celtiberians, of whom they are natural enemies. They represent a good quality but not quite elite contingent in the Ilergetan army. They are brave, and relatively well equipped with a helmet, padded armour, a scutum and a longsword making them well able to stand in a line as dependable infantry. Unlike the Celtiberians who centred their society on their local oppida, the Ilergetes are in this respect more like the Iberians on the coast, who have actual kings and oligarchies to rule them. And while the territory that each of these kings and their dependents control is not large, each of them can raise a small host from which a bigger army can be assembled under a high-king to fight in set-piece battles. Their defensive equipment is a helmet of typical Ilergetan design, with the characteristical neck guard, padded armour and a large scutum adopted from the Gallic tribes across the Pyrenees. For weapons they use javelins and a longsword that was most likely imported from Gaul through the Greek colony of Emporion. The scabbard however has been modified to be used slung over the shoulder in the Iberian style, rather than the original belt slide more typical of the Gallic custom. Historically, the Ilergetes were either Iberianized Celtiberians or Celticized Iberians that lived in the Aragonese area of modern Spain. The question lies in whether the migratory Celts actually imposed themselves on an Iberian substratum, or whether their society was just heavily impacted by Celtic influences at different points in their history. What is certain is the existence of Iberian inscriptions in their territory while no such Celtiberian finds exist. Greek and Phoenician elements were also abundant in their culture, foreign motifs being common in their art. Theirs was an advanced society which relied on herding and wheat farming as their primary sources of sustenance, while at the same time being heavily involved in trading activities with the interior as well as the coast having used bronze and silver coins from at least the 3rd century BC. Their capital was Atanagrum and other important cities were Eso and Iltirda. They were a powerful and expanding people, which occupied a strategic position, being intermediaries between the coastal and interior tribes. It was only natural that when the Second Punic War started, they would be at the centre of things. Under their high-king, Indibilis, they would fight for the most part on the side of the Carthaginians against Rome and her allied tribes such as the Edetani or Celtiberi (of which the majority had sided with the Romans at that point). Their help would be instrumental in the destruction of the Roman armies commanded by the Scipio brothers in 212 B.C and after changing sides, the capture of New Carthage in 209 B.C. Following the Carthaginian defeat at Ilipa, Rome’s attention would focus on submitting those who had sided with her enemies or that posed a threat. Despite having raised great armies and fighting bravely, the Ilergetes were defeated in two great battles, the last of which also claimed the life of their leader Indibilis. Having been submitted they were further humiliated by having the walls of their cities demolished and their weapons destroyed as part of the armistice. Later, this once great people would be forced to ask for Roman help, being incapable of defending itself against its enemies and thus faded into history as part of the growing Empire.